Nothing beats the exceptional look and quality of our Cocker Spaniel Figurine. Among the finest made, you will be provided with great satisfaction and long lasting enjoyment. Why not pamper yourself or give a loved one a Cocker Spaniel gift to show them how much you care. The Cocker Spaniel Figurine will make the perfect gift for any Cocker Spaniel lover. Shop with confidence, because all products come with a 100% customer satisfaction guarantee. Click over now to see the big selection of Cocker Spaniel gifts we offer. You will love the fine detail and clever way this Cocker Spaniel Figurine Black captures all the best features and spirit of your favorite friend. 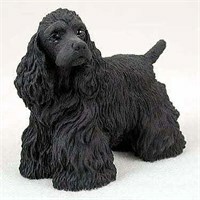 Our Cocker Spaniel Figurine Black will look great displayed on your desk at work or on a mantel at home. Perch this tiny statue next to a framed photo and you?ÇÖll have an instant focal point in your living room. 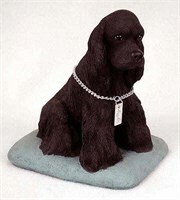 Our delightful Cocker Spaniel Figurine Black are made of stone resin and are hand painted to feature exceptional detail. This fine Collectible measures 4-5 inches in size. You will love the fine detail and clever way this Cocker Spaniel Figurine Black-White captures all the best features and spirit of your favorite friend. 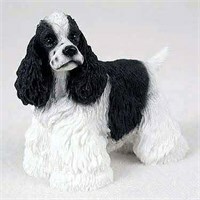 Our Cocker Spaniel Figurine Black-White will look great displayed on your desk at work or on a mantel at home. Perch this tiny statue next to a framed photo and you?ÇÖll have an instant focal point in your living room. Our delightful Cocker Spaniel Figurine Black-White are made of stone resin and are hand painted to feature exceptional detail. This fine Collectible measures 4-5 inches in size. You will love the fine detail and clever way this Cocker Spaniel Figurine Brown captures all the best features and spirit of your favorite friend. Our Cocker Spaniel Figurine Brown will look great displayed on your desk at work or on a mantel at home. Perch this tiny statue next to a framed photo and you?ÇÖll have an instant focal point in your living room. 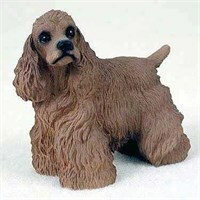 Our delightful Cocker Spaniel Figurine Brown are made of stone resin and are hand painted to feature exceptional detail. This fine Collectible measures 4-5 inches in size. You will love the fine detail and clever way this Cocker Spaniel Figurine Buff Mom & Pups captures all the best features and spirit of your favorite friend. Our Cocker Spaniel Figurine Buff Mom & Pups will look great displayed on your desk at work or on a mantel at home. Perch this tiny statue next to a framed photo and you?ÇÖll have an instant focal point in your living room. Our delightful Cocker Spaniel Figurine Buff Mom & Pups are made of stone resin and are hand painted to feature exceptional detail. This fine Collectible measures 4-5 inches in size. You will love the fine detail and clever way this Cocker Spaniel Figurine Buff MyDog captures all the best features and spirit of your favorite friend. 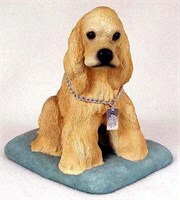 Our Cocker Spaniel Figurine Buff MyDog will look great displayed on your desk at work or on a mantel at home. Perch this tiny statue next to a framed photo and you?ÇÖll have an instant focal point in your living room. Our delightful Cocker Spaniel Figurine Buff MyDog are made of stone resin and are hand painted to feature exceptional detail. This fine Collectible measures 4-5 inches in size. You will love the fine detail and clever way this Cocker Spaniel Figurine MyDog captures all the best features and spirit of your favorite friend. 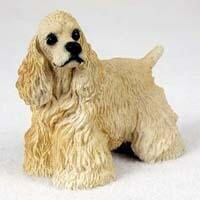 Our Cocker Spaniel Figurine MyDog will look great displayed on your desk at work or on a mantel at home. Perch this tiny statue next to a framed photo and you?ÇÖll have an instant focal point in your living room. 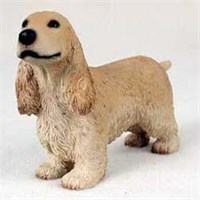 Our delightful Cocker Spaniel Figurine MyDog are made of stone resin and are hand painted to feature exceptional detail. This fine Collectible measures 4-5 inches in size.